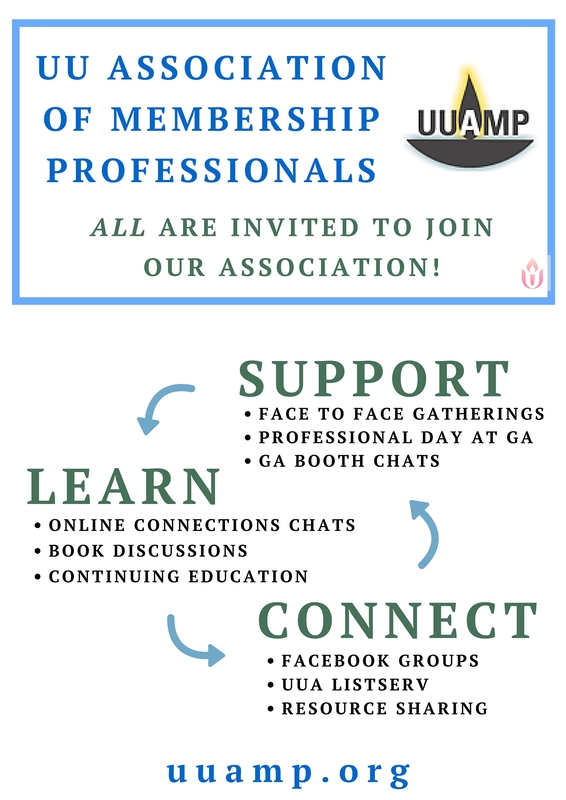 Welcome to the Unitarian Universalist Association of Membership Professionals (UUAMP). 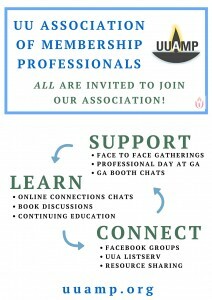 Our association was founded in 2011 to help membership professionals find the resources and other support they need. We also feel it is important to support all congregations, whether they have a paid staff person or not. Membership in UUAMP is open to both paid and non-paid staff & volunteers passionate about the ministry of membership. UUAMP Vice President Marie Luna says, "Membership professionals are in a unique position to help our congregations grow in many ways. Not only do we help people join our congregations, but we also help those members grow on their spiritual paths and in community. “Though there are fewer membership professionals than most other staff positions, more and more congregations are understanding the importance of having someone dedicated to the membership role. UUAMP is an effort to make sure congregations have a place to go for membership questions and concerns." Come and explore, grow and learn with us! Join UUAMP for only $50/year.